Some writings suggest the Van Eycks invented oil painting. Not so, for anyone poring over the old manuscripts and other texts will easily see that oil painting was known to the very ancients. Much more likely is the notion the brothers VE perfected a method of painting that allowed it to rise above its clumsy nature, to a level that finally surpassed the egg tempera methodology-- which, as the 14th Century Cennini wrote, was previously the ages-old favorite manner of achieving realistic depiction. The appearance of the Van Eycks work is rather stunning; and many historical oil painting experts have particularly focused research and guesswork upon the exact medium-means of the well-known brothers. Many painters today might agree with Laurie's 'standoil' point-of-view, for the surface of VE's works do bear a resemblance to having been painted with a polymerized oil, such as standoil. But there are various other means to achieving an enamel-like appearance, such as the use of slightly-aged paint (raw oil and pigment paint rubbed-up fresh in the evening and then utilized the following morning). Another method would be to simply add some coniferous balsam to the freshly-rubbed-up paint. By this balsam-route, a certain melting/difffusing occurs as the paint dries ; it levels out, forming a smooth surface. The problem with this second balsam method is the paint is somewhat weak to future varnish-removal ; plus, while painting in layers, further superimpositions with the same balsam-bearing medium can dissolve the underlying and seemingly dried layers. Another obvious strike against use of standoil-like boiled or sun-thickened oils comes quite directly from the actual history preceeding the Van Eyck-ian discovery. As it happened, the Italian Cenino Cennini wrote a now famous handbook ("Il Libro Dell' Arte") in the late 1300's wherein he mentioned that the best manner of painting in oils was to be had by use of the boiled or sun-thickened oils. Some might think this positive evidence for Van Eyck's later 1400's use of such thickened oils; however, the wizened Cennini plainly states that egg tempera is the better and more efficient method for depicting realism. He tells us the thickened-oil painting system is better suited for walls and doors. Thus, his own experience with the boiled and sunned oils show only what those of us who have tried them have found; that they represent a clumsy methodology with no outstanding advantages over egg tempera . The possibility that the VE's used natural resins cooked into oils has also been advanced. Certain resin-additions to oil paint can immitate the olden paint and so this theory has been promoted by numerous paint-detectives down through time. One proponent of this thinking was a Dr. Coremans of Belgium. 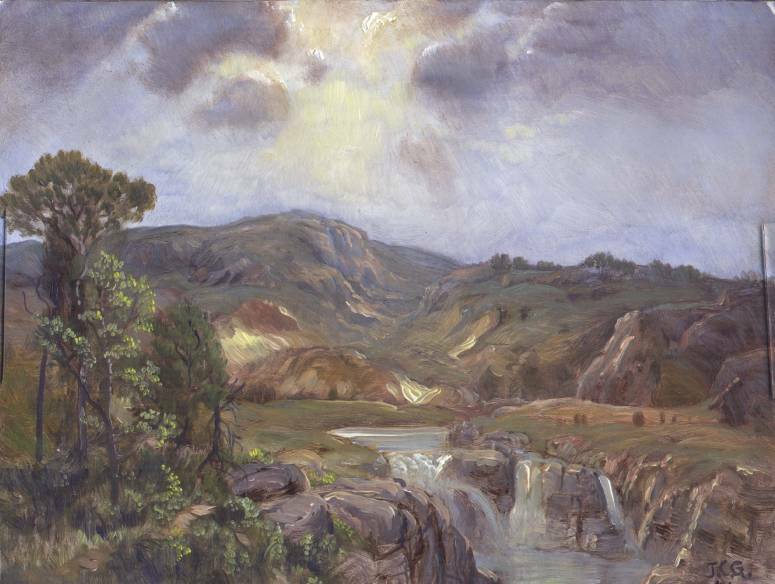 Compared to Laurie's theory which was based on a trial of actual painting practice, Coreman's theory had what many would regard as a more scientific basis. Dr. Coremans performed micro-chip paint analysis while undertaking restorations of Van Eyck's "Ghent Alterpiece". In defiance of many other theorists, Coreman's maintained there was no use of egg tempera by the legendary Dutch painter. Instead, Coremans found the paint contained oil and a substance showing characteristics of natural resins (see, for example, Frederick Taubes' 1953 book "The Mastery of Oil Painting"). Since Coremans' investigation, which, of course, was performed using the best analysis techniques of the mid 20th Century, many other 'scientific' painting experts have added their findings to the realm. Some of the newest investigators say the VE's paint chips test positive for some protein -- thus, in disagreement with Coremans, they maintain the technique involved an egg-type ingredient. I am sorry to say that "Modern Science" will never get to the bottom of VE's technique. Why? Because Modern Science is ever evolving, with newer testing procedures (and researchers) supplanting the old. Though we today may think our modern science knows all, we are just as delusional as those who inhabited this planet 100 years ago-- unwitting souls who felt and thought the very same about 'their' modern science ; believe me when I say, the modern science of 50 years from now will consider our time little more than the dark ages (and, in kind and proudly believing 'their' age is the age of truth, they will also be mistaken). I must think the better means to rediscovering VE's technique will always be to actually attempt to reproduce it ... and modern science is not capable of that route. Only talented painters will perform and produce in such realm. Unfortunately, painters are artists; and artists --like scientists -- can rarely get along or agree on much of anything. Regarding Van Eyck and his methodology, as with every other old master investigated down through the years, confusion is the proper descriptive word as we are now, today, even more perplexed by all the differing points of view. What is so great about VE's works? Simply this: Certain of these works seem to represent the perfect oil painting technique coupled with the perfect paint. True, Van Eyck's subject matter is not perfect in a reality-wise manner. No. Personally speaking, I would have to say it is this olden painter's surface quality above all else that I am most struck by. Again, his technique of paint application, the color breadth, the optical clarity of the whole-- all is so perfectly done. Of the various time-periods throughout oil painting history, it is this particular early Renaissance time period's productions that entice me to possibly consider a lost means of paint-making and technique-ability. Van Eyck's technique was quite different to that manner espoused by his predecessor, Cennino Cennini. Cennini clearly states that each object was to be rendered in paint by mixing and applying three separate color-tints using the thickened oils he mentions. The typical leveling effect of these poly-type oils will produce a smooth enamel-like surface. Now, the optical brightness of such work will come from the use of a white opaque paint-- such as lead white-- being actually mixed with the various colors to lighten them in tone. For instance, if a blue robe is to be painted, the painter need mix a tint matching the color of the highlight (light blue, say, ultramarine blue mixed with some lead white), the general body color (a medium blue), and the shadow color (perhaps the medium blue mixed with black). As such, Cennini is telling us that oil painting is to be done with opaque paint, the brightness of which is dependent upon the color-purity or the amount of white added. In such case, the brightness we see is reflected directly off the color and back to our eyes. I cannot argue against this method, for I have made some very fine detailed work in just such manner; and I see no reason why it should not stand well against time. Problem is, when such a 'water-color' technique is performed with straight oils--even thickened oils-- diffusion and spreading soon occur. As such, pigment particles slide around, coalesce in imperfections in the ground; or they diffuse around dust or grit and form noticeable halos; the end result being that nasty stained look-- quite un-appealing to the discerning eye. In noticing this trait, Benjamin R. Haydon wrote in his "Lecture on Art",1844, "Nothing is so hideous, nothing is so detestable as a picture glazed with a thin vehicle which was not prepared for it." Charles Eastlake summed it up in this way: "...for, in proportion as the pigment is thin, the vehicle requires to be substantial." [see "Materials for a History of Painting", 1847, page 504.] I shall add, if the proper medium can be had, history plainly shows that no harm comes from such practice. Sad to relate, this ever-so-effective and desirable practice is generally frowned upon today, owing to the inherent defects coming with use of our currently-available 'state-of-the-art' materials. Returning, I could reasonably suspect Van Eyck must have uncovered an actually innovative 'substantial' medium for performing his wizardry; and that it did not creep or crawl or diffuse itself once applied, and kept its place in the manner of a sort of liquid glass. Whatever it was, it was touted to be quite 'proof against water' (raw or thickened oil and egg are not) and it dried glassy-rich, without requiring any top coat of varnish. In my own experience, I have found that only a gel or "jelly" vehicle works well with this particular transparent 'water-color' oil painting method. A lost secret? Yes, I do reserve such suspicions. Granted, I wasn't around to look over the brother VE's shoulders, but, whatever their true means to creation, their wonderous works do seem to represent the most perfect transparent technique ever found within the oil painting craft. I am not alone in these 'lost means' thoughts. I do not think the VE's knew their technique and medium would be so durable, for how could they truly know such a thing? But I do think they realized and recognized a good thing when they found it (and utilized it). 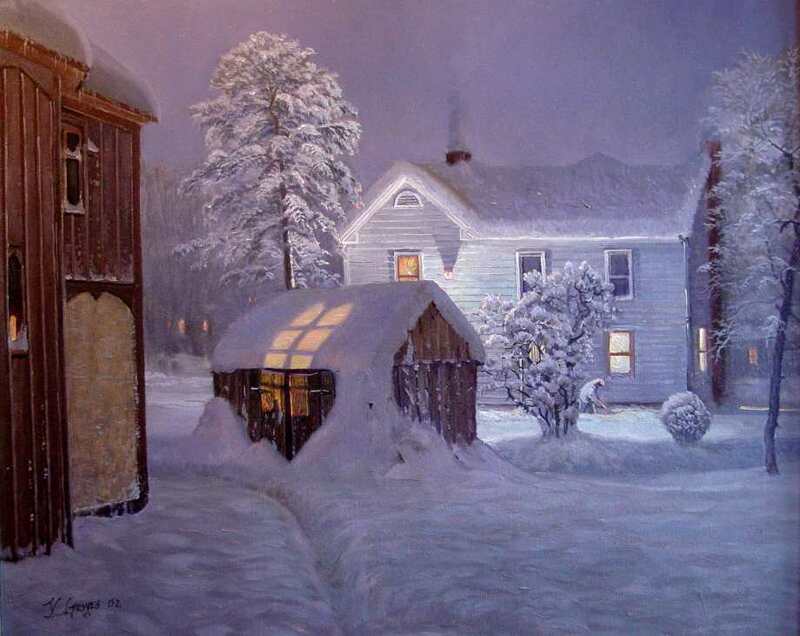 It was this new discovery, this liquid glassy medium� a medium so conducive to a rich optical glow and ease in paint-application-- that allowed oil painting to finally capture the easel-painting prize long held by egg tempera. This method and medium simply overwhelmed egg tempera in nearly every way! The transparent manner of painting never quite died, though it did succumb to a pseudo-opaque method which became increasingly popular during the 1600's. The opaque manner was dependent upon the easy availability of lead white. Lead white allowed texture. Texture allowed another dimension to painted works; and so we find later attempts to combine the opaque in the initial modeling (grisialle) with the transparent in the later stages (glazes, veils) of a multi-layered conjoined opaque-transparent working manner. In so many good hands the effect was certainly wonderful. Attempts to re-attain the transparent glow did not seem to meet the Van Eyck performance. Several routes were tried to escape or limit the stainy look caused by raw and thickened oil. The use of wax engendered the gel-effect but it did not truly match the prior performance. Ditto wax and resin. Resin and oil in the way of megilp offered some advantage, but I do wonder about total facility in use and its permanency. Is it any wonder that today, we have come full circle; egg tempera is once again regarded as the better method by ever so many practicing painters. Plain and simple, these egg tempera painters are not happy with what has become the standard opaque oil painting methodologies. Again, whatever it was, this lost manner/medium, a form of easier and more perfect oil painting was the result. It is often noted that oil painting was actually perfected during this particular time frame and much happening within the oil painting realm ever since has been merely a declination. A bit harsh of a sweep, but I can somewhat sympathize with such critique. It would be wonderful if an oil painting could always be created in one even layer. Such a feat would negate most of the effects of poor craftsmanship, as a single layer of paint has instrinsic durability against fissuring, cracking, and other negatives arriving from placing one layer of paint atop another. And so why the need for paint-layers? Simply this: to get it right. To correct, to improve. But how many layers are needed? Unquestionably, the fewest the better! In general, the 1500-1600 Italian system -- such as Titian's manner-- was dependent upon many layers; while the Northern system of the same time-period called for as little beyond one as possible-- and this according to Van Mander's historic writing (see Eastlake's 1st Volume, the chapter headed "The Flemish Technique, Considered Generally) which, for example, is quite characteristic of Rubens' usual method. Overall, I think most would agree that, technique-wise, rather perfect realism using common opaque oil paint can arrive nicely from a use of three or more paint layers. These three basic layers would be a monochrome, a dead-coloring layer, and a final layer of glazings and veilings with some opaque hightlights. This route is essentially the aforementioned old Italian system. There's leeway, of course. Some might easily forget the monochrome and go directly to an initial colorization; and, beyond the three basic layers would be "heightening" layers applied to further inhance the work by giving additional realism and increased luminosity ( I understand a Van Eyck painting examined by Cormans appeared to have seven actual layers of paint in certain parts. Then again, I also understand, in some cases, additions to VE's works were subsequently applied well after his demise and by other painters hired to "improve" subject matter by the Church ). By contrast, the Northern method was based upon achieving a final painting in a single and mostly transparent layer. It is quite possible/feasible to paint a marvel all at once, in a single layer, finishing each small section at a time by painting atop a carefully-delineated drawing. If done with a transparent technique over a white gesso ground (sealed, of course), such work would last very well and remain very bright. I cannot say whether Van Eyck always painted in such a single layer. From my own experience I can say it is also easy to believe that at least some additional glazing or veiling and heightening should be performed afterwards to bump effects. Coreman's evidence concerning the Van Eyck he analysed maintains use of multiple layers.... though, again, was this an attempt at subsequent corrective repaintings by Van Eyck.... or something from the later hand of another? Anyway, I do know that realism builds with layers; and, without a doubt, many other later 'old master' painters did go the layered route. Something should be considered, though. With layers, a fast and firm drying of each paint-application is a valuable asset to such workmanship/craftsmanship. History maintains the Italian 's sunny clime rendered this multi-layered-approach quite feasible by simply placing the painted work out into the sunshine to bone-dry it nicely between coatings. Within the more northern climates, this heat-and-sunning ability would be much less feasible, for the Northern painters had to contend with their colder and wetter realm. Simple oil and pigment paint hates damp and cold! Such conditions warranted a different painting system... and very likely a much different painting medium.to suit. Along with knowing technique comes the better medium-means to that technique. Oil, by its nature, flows, saturates, spreads. Even standoil does this and in some respects it is worse than raw oil. Flowing and spreading oil can do things I don't approve of. I want my oil paint to behave itself and stay put where I deem it. I don't want it moving around or slumping after I've taken such care to put it in its proper position-- or its proper shape. Thus, I must also believe the best means to manipulation and painting technique in the landscape is through the use of a gel-type medium; that is, the oil and paint possess the thixotropic nature of a supple jelly. Such a substance can be applied thinly to the ground -- with no eventual running or spreading-- and every brush-stroke and hatching placed upon and into this medium may be, when desired, perfectly retained. Furthermore, monochrome and paint-layers painted with and into a gel-type medium are microscopically suspended above the white ground, leading to optical effects not attained through the use of non-gelled oils and paint. Such common paint is in no way suspended and thus applied exactly upon the ground or underlying colors. In sum, a certain quality of heightened color and depth is possible with gels which cannot be found through various other means. 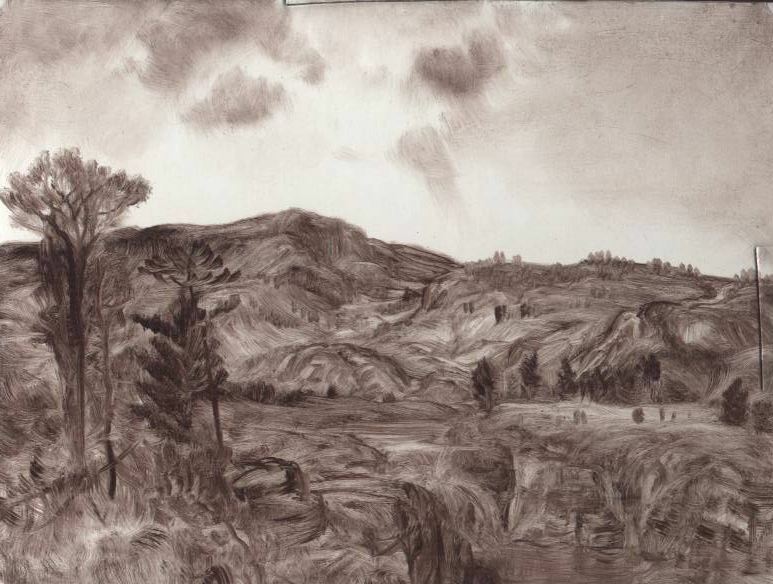 As to layering, having a detailed monochrome composition (or, instead, a built-up grisaille) underlying the superimposed paint layers allows realism and often a luminescence which cannot be attained otherwise. Again, for greatest effects the monochrome brush marks must, of course, remain perfectly preserved as intended by the painter-- and this preservation must continue through their drying stage; that is, no melting or spreading and flowing can occur. Further, overpainting must not dissolve this monochrome layer and yet it must stick well to it. The following work titled "Night Without Darkness" was done in oil using a layered approach beginning with a monochrome scrub-in of thinly-applied lampblack. Once dried this monochrome was glazed over with a predominant local color --this to help establish a close tone and color reference to help my judgement-- and then, immediately while wet, re-inforced with the proper and actual opaque or semi-opaque paint. Once that secondary layer was dried, some further glazing, veiling and heightening was performed. A supple painting jelly made by mixing walnut oil with the Gelling Oil was used from start to finish. Painting mediums run the gamut, being taylored to the preferential working manner of the painter. Those who paint in a mostly opaque manner will find regular oil-and-resin mediums generally quite expedient. But there is another route to great painting, that of the mostly transparent manner. This is a system involving application of the colors atop a white ground in such a way that the white beneath allows a 'stained-glass' richness not attainable through the mostly opaque manner. There are various ways to approach the transparent system-- and various mediums have held favor down through time for such approach. I have found the gelled mediums to be amazing performers with this illusive and illusionary system. The following image shows the optical and brushing character of yellow ochre, pure, in a straight lean paint applied atop a white non-absorbent ground (A); then with extra oil added (B); and finally the lean ochre with a 50% amount of 'jelly' added(C). This jelly was constructed by adding two parts walnut oil to one part Gelling Oil. There are differences between the three fully-dried ochre paint samples. Do realize, these optical differences are more noticeable in real life than in this monitor image, which lends transparency where none or little exists. We can see the 'straight' lean yellow ochre labeled (A) retains the brushstroke hatching but is dull and offers little by way of transparency. In other words, it offers mundane optical refraction; yet this lean paint is espoussed today as being the ticket to great painting. (B) is visually richer and more glowing in color than (A)owing to the extra oil mixed in. Not excessively oily, the paint remains without running, though oil-diffusion has softened everything-- even the letter "B" has disappeared. Adding some resin-varnish would help allay diffusion, though it will still fall short of a 'jelly'. The extra oil allows easier brushing and finer lines; but we are warned today by many experts to stay away from this oil-rich or medium-rich paint. (C) shows the advantages of the actual jelly medium, whereby transparency allows the refractive optical glow and marked vivacity. Simple pressure of the brush stroke delivers all values from dark to light merely by dexterity as it slides across the white ground-- everything keeps its intended place w/o diffusion. Notice the letter "C' appears as nearly pure white. 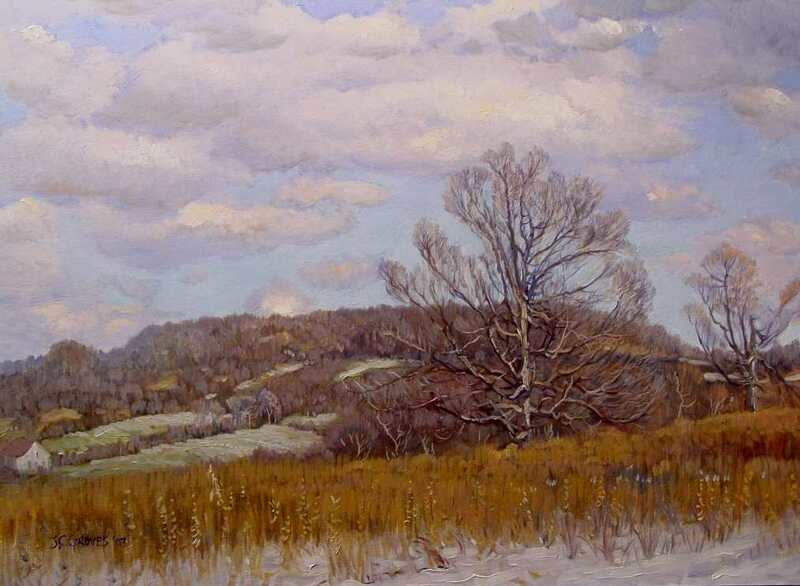 This shows the capability for a complete pull-off of the paint from atop the white ground-- a feat often needed in a full-range oil painting technique; and believe me, this is a valuable trait to have in one's arsenal. What this illustration shows is that any color mixed with the jelly medium can be utilized for a fast efficient initial modeling of any object -- and without normally needful immediate additions of a light (for highlight),or a dark (for shadow). This extended range of a single color occurs through suspension of the pigment in a sort of liquid glass material-- allowing a brighter inherent optical effect lacking in the noticeably more somber straight paint on the left. Then too, if one wishes smooth gradation, the passing of a soft brush over the whole produces that effect with equal ease. Thus, all advantages are allowed by such a thixotrophic medium; and I can think of no downsides. Some will argue against ample medium in oil paint today, preferring to starve their pigments of oil; but this simple illustration shows how lean paint lacks the brilliance that comes from adding medium. After all, this refractive brilliance is the strength of painting in oil. The glassy medium allows this brilliance. And, BTW, the richness in effect will increase with paints that are more saturated in color and of darker value. Yellow ochre is a mid-tone paint. Imagine the effect with Venetian red, or ultramarine. There are many olden works showing the apparent use of thixotropic mediums. The ability of a thixotropic medium to allow the capture of brush hatchings is well-known. Sampling its historic use, this thixotropic effect is often seen in Ruben's works, leading many today to believe this famous artist used megilp. Another often seen example is the very "wet" or oil-rich looking paint so familiar to Frans Hals' works seems perfectly derived from a gel-type medium. Neither of these well-known masters used what could be termed "dry" paint. On the contrary, the juicy oily media of their choice presents itself to the keen observing eye....and shows no real harm coming by way of painting with an oil-rich medium. But what medium was this? . Following right along with the availability of solvents, a thorough historical search will generally show the invention of megilp occurred sometime in the later 1600's-- and it caused a stir. You see, it was believed the lost 'secret of the ages' oil painting additive had once again been found. And ever since then, about every one hundred years or so, the mixing of spirit mastic varnish with leaded drying oil engenders someone of authority to proclaim that, once again, the secret of the old masters has been found ( see my report on Megilp found on the Mediums page, linked at end of this report). Aside from Megilp, another method for achieving a jelly-like medium is to cook a small amount of wax into it --perhaps an eighth part. Much can be said for this method. Wax is known to have been used by Reynolds and less cracking in the dried paint film results with this substance included in the medium (Yes, I know many of R's paintings are cracked, but those areas containing the wax are amazingly dandy). This is because the wax never truly dries out-- and so the paint stays rather permanently flexible. Additionally, for a number of years afterwards, the wax stops the painting oils from yellowing. BTW, stand oil also functions in this initial non-yellowing manner. You see, few know this but if the paint never fully dries, the drying yellowing effect inherent to linseed oil will not manifest itself. That is to say, the paint remains light in color. Stand oil is very slow-drying and remains "bright" for many years. However, it does eventually dry and the yellowing is then just as bad as raw linseed oil. It's true. As for the wax, as an ingredient in oil paint, it is, of course, easily dissolved by future cleanings with mild solvents. I have heard no one mention wax as the means to the perfection of oil painting....at least not in the Van Eyck's time frame. Of course, we might presume wax would be easily detected by paint analysis... but maybe not. BTW, another offshoot from Meguilp are the 19th century Copal-Meguilps. One such medium still in use is known as Roberson's Medium. This particular medium was a Meguilp fortified with hard copal oil varnish, which, not surprisingly, does seem to strengthen it. The 'mortar' is thus made stronger against future cleaning solvent attack. The mastic may still dissolve but the copal 'glue' does not -- thus the weakness of one resin ingredient is somewhat allayed by the strength of the other. As mentioned slightly above, regarding a layered painting technique, susceptability to harm from overpainting must be considered. Many mediums on the market today contain turpentine or other solvents in substantail amounts. Meguilp is no exception; and, when freshly-made, this jelly contains about 30% turpentine. Just be aware that, when overpainting atop a seemingly dried underpaint (even a well-dried one) the turpentine used in these mediums can dissolve the monochromes and superficially-dried paint-layers. Thus, caution is in great order. I here provide another 18x24 work produced using painting jelly made with the Gelling Oil. Titled "Sentinel of the North Slope", this work was done in two layers over a very smooth ground of white. The first was a multi-chrome glazed-on underpainting made with thin transparent and varying mixtures of Ult, YO, and Iron oxide red (plus a slight addition of viridian added to the ult for the horizon's light blue area above the distant hill top). 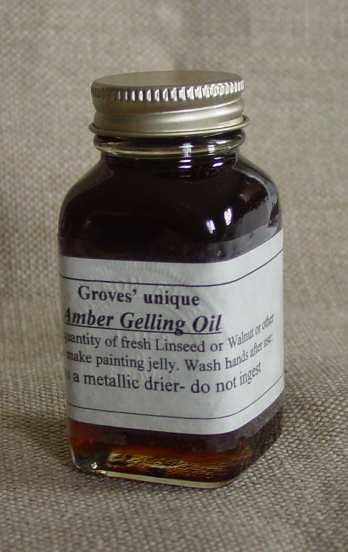 The Gelling Oil and the Painting Jelly made there-from does not harm itself by repeated applications; there is minimal solvent action upon the dried paint. The Gelling Oil is practically colorless and can be made in several ways but we now offer it in an 80 mil. glass bottle. A small amount is extracted from the bottle using, say, the clean palette knife-tip and placed upon a sheet of glass. Afterwards, raw walnut (or linseed oil ) is added and mixed with the gelling oil thoroughly using the knife. The combination produces a light and clear 'jelly' immediately. I then mix in another amount of oil to achieve a softer, more supple gelled painting medium. This soft jelly is then added in slight amounts to handmade paint (about 30-50%). This immixture allows for faster drying and easy facile brushing-- this freeing effect greatly aids the use of small soft brushes necessarily required for detail-work. The paint dries with a wonderful gloss. Not surprisingly, this painting jelly also works very well with commercial tube paint. I prefer to mix the Amber gelling Oil with raw unrefined walnut oil; using a double or eqaul amount of the raw oil. It behaves like a firm or soft painting 'butter'. Essentially, adding a one or two "drop" amount of the painting jelly is all that is necessary to get the proper consistency with my already hand-ground heavy cream paint. By use of the painting jelly, the paint becomes soft and easily-brushed yet it stands to much better attention and keeps its place where I put it. Again, it does not set up too soon like megilps and exhibit dragging brushwork problems. Yet it usually dries overnight and I am ready to re-paint on the morrow. I also use the painting jelly to lubricate the ground before painting my first and second layers. In subsequent layers, as the tints (glazes, scumbles) are mixed more fluidly with the jelly dominating the mix; there is no real need to oil-out. The Gelling Oil is aptly named because it gels almost every other oil -- even standoil gels when mixed with the Gelling Oil.. Again, the straight liquid Gelling Oil from the bottle may be mixed with an equal quantity (or, for a softer jelly, double amount) of any other fresh oil (such as Walnut or Linseed) to create a supple painting jelly. If necessary, drying can be further expedited by a placement of the work in direct sunlight for an hour (something about Sunlight causes oils to catalytically begin drying-- even though the work is soon brought indoors again). Once completed, the final work needs no varnish as it will be very glossy of itself. Should a dull spot be encountered, a simple whisper-thin scrubbing of painting jelly is all that is needed to fix the problem. a)Monochrome in a single color, usually Black or Black and a Red mixed to a brown. This allows the setting up of the composition without color. The ground is initially oiled out using painting jelly. Soft or firm brushes are used to paint the monochrome color into this thin gel layer and every hatching of the brush is captured. Detail within this monochrome can be perfectly accomplished to any degree. Any areas rubbed out by way of correction should be first revitalized by more of the painting jelly. B) The next day or so, after drying, another layer of painting jelly is brushed out over the monochrome and colorization begins by first glazing or veiling a local color over the area needing work and more details painted into this wet color. The monochrome showing through the thin local color aids the finishing detail. A degree of reality is achieved through this means that cannot be had in any other way. C) The work is allowed to dry to a glossy perfection. Or, after drying, further correction and workmanship is undertaken, such as detailing additional tree-branches or applying further haze atmospherics. Generally, it is not necessary to apply any lubrication to help with such details, but rather, a bit more of the jelly than previously required is utilized as an addition to the paint, thinning that paint for perfect ease in applicatiom. With experience, the painter should progress towards use of a multichrome performance atop a preliminary drawing, whereby the true local colors are directly applied over the white ground by use of the jelly, with no monochrome necessary. Such a multichrome will require little by way of finishing; plus, the illumination from the white ground will show to greatest effect. Illustrations: This is a small painting done using the painting Jelly as the medium. 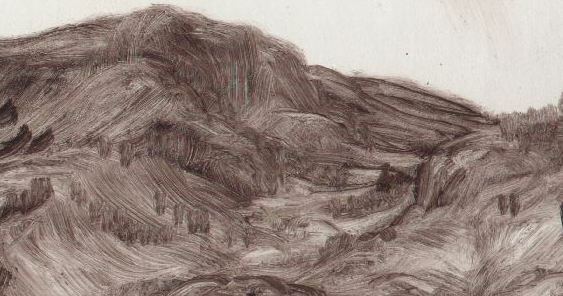 Though it represents a grand view landscape, it measures only 8 x 11 inches (so as to fit on my small scanner bed). The following image shows the work after the second stage. 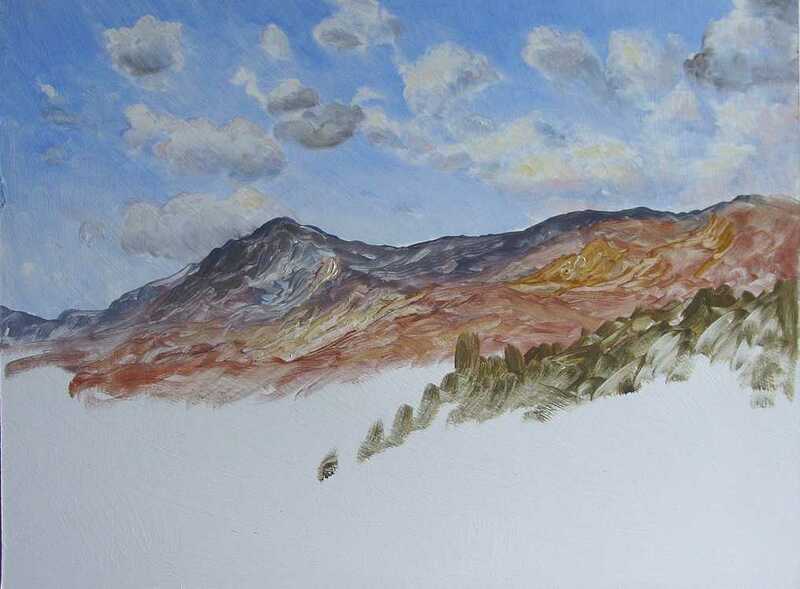 To demonstrate correctability, I have deleted a foreground tree's upper foliage and, instead, through caprice of slight overpainting, incorporated it into the distant mountainside. Note: I personally would seek a third layer of painting to allow atmospheric haze and illumination in the distance. This is veiling and would help the 3-D illusion of distance receeding from the foreground. Also, to heighten colors, glazings could be simply added atop the existing colors. Again, no further lubrication is necessary, the jelly being increased in the paint make-up instead. In common with meguilp, Gelling Oil does contain a metallic drier and must be handled with much the same safety and health considerations as Meguilp. It does not contain any balsam, artificial resins, wax, aluminum stearate, or mastic, hydrogenated caster bean oil, or other mechanical gelling agents-- like bentonite or aluminum hydrate. Its formula is not historically-mentioned. As the inventor, I have gone to a great deal of troubles to create it ; thus, like all art material manufacturers today, I keep it to myself. Still, interestingly, the compound could have been made using ingredients readily available to the Van Eycks. These ingredients are known to be very lasting, yet, having invented the Gelling Oil in 1994, I cannot make any statement concerning absolute longevity (contrastingly, in the case of Gentileschi's amber medium, we have the hind-sight of nearly 400 years to gauge results). 1. Speeds drying, allowing expediant layering. 2. Provides brilliant optical depth and color effects. 3. Retains brush hatchings aiding preliminary drawing/shading; or development in full multichrome. 4. The painting jelly can be applied thinly as the final perfect coating for the work; when made with raw unrefined walnut oil, it will not develop a 'gallery tone'. 5. The jelly allows perfect rich glazings that stay where placed and remain bright..
6. A small addition renders thick clumsy dragging paint very facile and easy to apply or brush out. 7. The jelly can be used in any amount addition to oil paint ; anywhere from a small percentage addition to 100% total (say, when used as the final coating over sunken areas). However, it is important to always bear in mind, the less pigment and more oil in a paint, the thinner must be the application ; thus, a rich-in-medium glaze (very little color and much medium) should be applied whisper thin, and this to allay the future yellowing of the oil. Tests show the Gelling Oil and resulting painting jelly yellow less than linseed oil. Still, do not over-use these materials or a 'gallery tone' can/may occur. a) When the Gelling Oil is mixed with half itself and raw oil, a polymeric effect resembling stand oil-use results in drying. This effect is similar to what is obtained by adding either stand oil or balsams to oil paint (though there is no stand oil nor balsam in the Gelling Oil). b)This melting effect does not disturb the brush hatchings, and yet it (c)provides, as well, a much more perfect, even, and receptive surface conducive to facile and easy layering additions -- even with soft brushes. No horn-like effect ever occurs. 9. The addition of the jelly strengthens oil paint. 10. Painting jelly dries water clear. 11.Like the other gel-media we offer, full gelation is now immediate when oil is combined with the Amber Gelling Oil. For those curious, the following is the 1500's story of Van Eyck's 'discovery' of oil painting as written by Georgio Vasari. "Antonello da Messina, Andrea del Castagno, and Domenico Veneziano" - from Giorgio Vasari's "Lives of the Artists"
From the time of Cimabue pictures either on panel or canvas had been painted in distemper, although the artists felt that a certain softness and freshness was wanting. But although many had sought for some other method, none had succeeded, either by using liquid varnishes, or by mixing the colours in any other way. They could not find any way by which pictures on panels could be made durable like those on the walls, and could be washed without losing the colour. And though many times artists had assembled to discuss the matter, it had been in vain. This same want was felt also by painters out of Italy, in France, Spain, and Germany, and elsewhere. But while matters were in this state John of Bruges, a painter much esteemed in Flanders, set himself to try various kinds of colours and different oils to make varnishes, being one who delighted in alchemy. For having once taken great pains in painting a picture, when he had brought it to a conclusion with great care, he put on the varnish and put it to dry in the sun, as is usual. But either the heat was too great or the wood not seasoned enough, for the panel opened at all the joints. Upon which John, seeing the harm that the heat of the sun had done, determined to do something so that the sun should not spoil any more of his works. And he began to consider whether he could not find a varnish that should dry in the shade without his having to put his pictures in the sun. He made many experiments, and at last found that the oil of linseed and the oil of nuts were the best for drying of all that he tried. Having boiled them with his other mixtures, he made the varnish that he, or rather all the painters of the world, had been so long desiring. He saw that when the colours were mixed with the varnish they acquired a firm consistence, and not only were they safe from injury by water when once they were dry, but the colours seemed to glow and had more lustre without the aid of any varnish, and besides, which seemed more marvellous to him, the colours blended better than in tempera. The fame of this invention soon spread not only through Flanders, but to Italy and many other parts of the world, and great desire was aroused in other artists to know how he brought his works to such perfection. And seeing his pictures, and not knowing how they were done, finally they were obliged to give him great praise, while at the same time they envied him with a virtuous envy, especially because for a time he would not let any one see him work, or teach any one his secret. But when he was grown old he at last favoured Roger of Bruges, his pupil, with the knowledge, and Roger taught others. But although the merchants bought the paintings and sent them to princes and other great personages to their great profit, the thing was not known beyond Flanders. The pictures, however, especially when they were new, had a strong smell which mixing the medium with colours gives them, so that it would seem the secret might have been discovered; but for many years it was not. Now there was a certain Antonello da Messina, a man of an acute mind and well skilled in his art, who had studied drawing at Rome for many years and afterwards worked at Palermo, and came back to Messina his native place, having obtained a good repute for his skill in painting. He, going on business from Sicily to Naples, heard that this picture by John of Bruges had come from Flanders and that it could be washed, and remain perfect. The vivacity of the colours, and the way in which they were blended, had such an effect upon him that, laying aside all other matters, he set off for Flanders. And when he came to Bruges he presented himself to John, and made him many presents of drawings in the Italian manner, and other things, so that John, moved by these and the deference Antonello paid him, and feeling himself growing old, allowed Antonello to see his method of painting in oil, and he did not leave the place until he had learnt all that he desired. But when John was dead Antonello returned to his country to make Italy participate in his useful and convenient secret. And after having spent some months in Messina he went to Venice, where, being a person much given to pleasure, he determined to settle and end is days. T here he painted many pictures in oil, and acquired a great name. Among the other painters of name who were then in Venice, the chief was a Master Domenico. He received Antonello when he came to Venice with as much attention and courtesy as if he were a very dear friend. Antonello therefore, not to be outdone in courtesy, after a little while taught him the secret of painting in oil. No act of courtesy or kindness could have been more pleasing to him, for it caused him to gain lasting honour in his native place. Afterwards he was charged to paint a part of the larger chapel of S. Maria Nuova, another part being given to Alesso Baldovinetti, and a third to Domenico da Venezia, who had been brought to Florence on account of his new method of painting in oil. Then Andrea was seized with envy of Domenico, for although he knew himself to be more excellent than he in drawing, yet he could not bear that a foreigner should be caressed and honoured in such a manner by the citizens, and his rage and anger grew so hot that he began to think how he could rid himself of him. Nevertheless, Andrea was as clever in dissimulation as he was in painting, and could assume a cheerful countenance whenever he liked; he was ready in speech, proud, resolute in mind and in every gesture of his body. Being jealous of others as well as of Domenico, he used secretly to scratch their paintings. Even in his youth, if any one found fault with his works, he would let him know by blows or insults that he knew how to defend himself from injury.